A year and a half after the summer that changed her life, Maggie Thrash wishes she could change it all back. She’s trapped in a dark depression and flunking eleventh grade, befuddling her patrician mother while going unnoticed by her father, a workaholic federal judge. The only thing Maggie cares about is her cat, Tommi . . . who then disappears somewhere in the walls of her cavernous house. So her search begins — but Maggie’s not even really sure what she’s lost, and she has no idea what she’ll find. 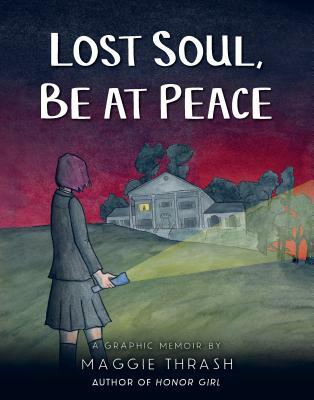 Lost Soul, Be at Peace is the continuation of Maggie’s story from her critically acclaimed memoir Honor Girl, one that brings her devastating honesty and humor to the before and after of depression. Maggie Thrash is the author of the graphic memoir Honor Girl as well as the Strange Truth books. She is a former staff writer for Rookie. Maggie Thrash lives in Delaware. Mixing recollections with a supernatural Hamlet-inspired theme, her watercolor-tinged illustrations add a wonderfully ethereal layer to an already nuanced offering. Defying genre boundaries, Thrash has proven herself a capable memoirist able to pinpoint her own pivotal life moments, turn them into art, and take risks with conventions. Nearly all characters present as white. A thoughtful and compelling exploration of adolescence. The author/illustrator looks back on her teen years with a pitch-perfect blend of caustic humor, melancholy, and tenderness, depicting her younger self’s frustration with her wealthy, ignorant cohorts and her growing understanding of her own privilege...Thrash boldly mixes memoir and fiction for a perceptive exploration of her past that will resonate profoundly with readers of Honor Girl, Laurie Halse Anderson and Emily Carroll’s Speak: The Graphic Novel, and Katie Green’s Lighter Than My Shadow. This should resonate with readers looking for unusual realistic fiction that doesn’t shy away from difficult themes. In a closing note Thrash comments on the facts at the core of her tale—privilege, loneliness, coming out, and yes, a lost cat—and how she reconciles memoir with ghost story. Readers who met Maggie in her Camp Bellflower summer will be happy to see her work her way toward acceptance. Thrash’s bone-dry observational humor stays provocative...and her rugged draftsmanship and solid toolbox of visual storytelling techniques can handle any emotional register with honesty: teen ennui; cold exchanges with her parents; angry jabs at the rich, bigoted white boys at her school; and the chilling dreams that haunt Maggie’s nights. Simultaneously a coming-of-age tale about a lonely teenager and a ghost story, Thrash's spooky storytelling is a clever tool to contextualize family and identity. [Thrash's] original, challenging, tragicomic story forges new territory in the world of queer storytelling.